You don’t have to know much about Morocco to be aware of its exotic reputation. This North African country the size of California has long been a Hollywood favorite, a setting for foreign intrigue, furtive love affairs, and mysterious customs. “Lawrence of Arabia” was filmed here. “Casablanca” was set here. More recently, “The Bourne Identity” with Matt Damon was shot here. Between them, the three films took home 13 Oscars. Visitors to Morocco can easily take home their own treasures from this colorful country. Shopping here is a memorable experience, not only in terms of what’s for sale, but for where you buy it. 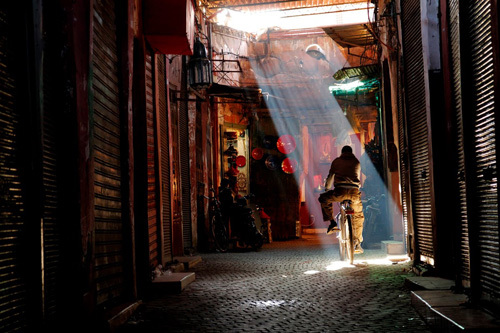 In many of the Moroccan cities – Fes, Marrakech, and Casablanca – most of the shops are found in the ancient walled cities called medinas. The Fes medina is one of the biggest. A maze of more than 9,000 narrow alleyways, it is solely for pedestrians and the occasional donkey, making it the largest car-free urban zone in the world. It’s easy to get lost here, but serious shoppers find it’s worth the challenge. Inside this medina are literally more than 10,000 shops. Exquisite ceramic pots. Freshly picked dates and olives. Fine leather bags. Exotic spices. The medina is a dizzying array of colors, textures and smells. Everything here is either home grown or hand made. Nothing is frozen or made in China. This is as much an art gallery as a shopping center. Much of the appeal of shopping is seeing the artists – the weavers and potters – practicing their craft right there in front of you. Their skills have been passed on from one generation to another. But some trade secrets they are willing to share. For example, why is Fes pottery considered some of the finest in the world? 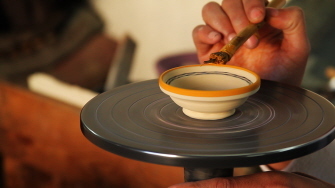 “It is partly because of the type of clay that we use,” explains Abdul, the owner of the shop. “Its strength makes it easy to make the different shapes and forms.” Abdul says it took him five years to learn how to manipulate the clay, and create the beautiful geometric designs and colors that have come to distinguish the vases, jars, and plates he has on display. 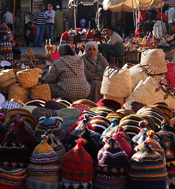 Haggling over price is itself an art in Morocco. No one accepts the first offer. But how much the shopkeeper is willing to bend depends, of course, on what’s at stake. For Moroccan rugs, what’s at stake is their very future. It takes almost a year to make a one of a kind rug. In China, machines can produce hundreds of rugs a day. With such competition, it’s hardly surprising that rug making is fast become a dying art. The only thing that will save it is a widespread appreciation, on the part of travelers, that such craftsmanship is worth saving, and that the crafts themselves are worth owning. They might, in fact, be worth a trip to Morocco. Interested in Going to Morocco? Shopping for hand-made treasures is one of the many reasons to visit Morocco. 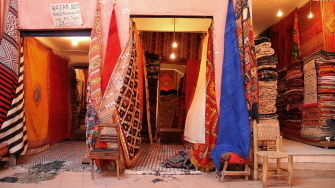 But just as there are many varieties of rugs, there are a variety of ways to visit this North African country. Do you want to explore the former Imperial cities? Visit an isolated Berber village? Observe the ancient tradition of the Fantasia horses? Spend an evening enjoying Sufi or Sephardic music? Do a bit of trekking in the Sahara Desert on camels? Hike in the Atlas Mountains? Relax in the seaside town of Essaouira? How does one even start setting up a trip to Morocco? Farewell Travels, your travel concierge, can help. We are forever on the lookout for select hotels, resorts, inns, restaurants and travel companies around the world that are outstanding in what they do. Contact us to make your trip everything you want it to be. Call us at 203-222-7238 (EST) or send us an e-mail here, letting us know when we can best reach you to discuss the possibilities.